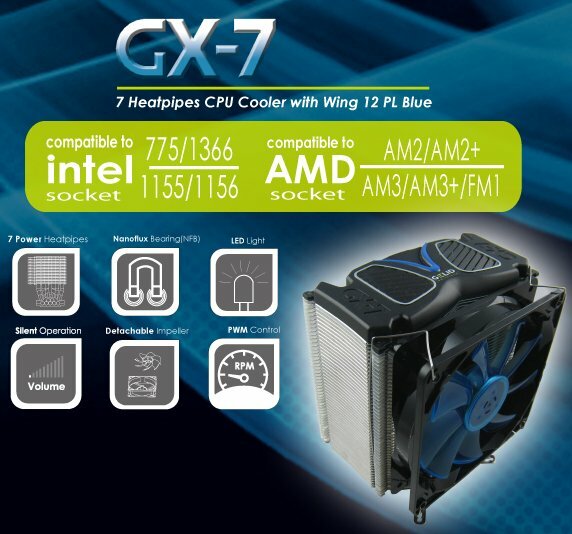 GELID introduced the GX-7, a new CPU cooler designed for gamers. It features seven heatpipes, V-shaped aluminium fins and a 120mm Wing 12 PL fan. Engineers at GELID Solutions have created an outstanding new CPU cooler with 7 power heat pipes. Contrary to traditional heat pipe arrangement for this GAMER CPU cooler “GX-7”, a special array of heat pipes was used to take full advantage of all 7 heat pipes heat transfer capacity. Further V-shaped aluminum fins were used in the center of the heat sink to allow airflow to reach the heat sink more evenly. Openings inside of the heat sink and near the heat pipes let fresh-air flows in from the top and the bottom to zones normally poorly ventilated, and eliminate the creation of hotspots. The unique heat sink shape supports dual fans. Included in the GX-7 is the multi-award winning Wing 12 PL fan, allowing the cooler to reach remarkable temperature. The Wing 12 PL Blue features blue LEDs and unique Nanoflux bearing which ensures a friction-free and silent operation. Thanks to the clever design and magnetic bearing, the impeller can be detached for easy cleaning. Additionally, fan blade winglets were designed to achieve larger airflow and greater static pressure. The fan also includes a premium PWM control, so the temperature can be controlled precisely by the BIOS. The patented Nanoflux bearing (NFB) incorporates a clever magnetic design and very high precision manufacturing. It runs friction-free and operates noiselessly. Electromagnetic fields are exploited to keep solid parts from touching. The load is carried by a magnetic field. The Nanotechnology composite ensures lowest abrasion and extreme durability (MTTF 100’000 hours). The nano composite material is self-lubricating compared to conventional sleeve and ball bearings. The high precision self-lubricated material of GELID Solutions Nanoflux bearing eliminates oil leakage. The multi-award winning high performance GC-2 thermal compound is already included in the package. Additionally, mounting clips for AMD AM2, AM2+, AM3, AM3+, FM1 and for Intel 775, 1366 and latest 1155 &1156 sockets as same as back plates for Intel LGA 775, Core i3,Core i5 and Core i7 boards are all included. The cooler is RoHS and WEEE conform and carries a 3-year warranty. “The GX-7 when using dual 120mm fans can provide cooling equivalent to liquid cooling solutions“, said Gebhard, Sales Director of GELID Solutions Ltd. The “GX-7” CPU cooler is available now and has a MSRP of USD 65 or Euro 45.